How Brazil Saved The World Cup In The Aftermath Of World War II : Parallels Germany invaded Poland in 1939, and the world's biggest sporting event was almost relegated to the second division of history. That's when Brazil stepped up. 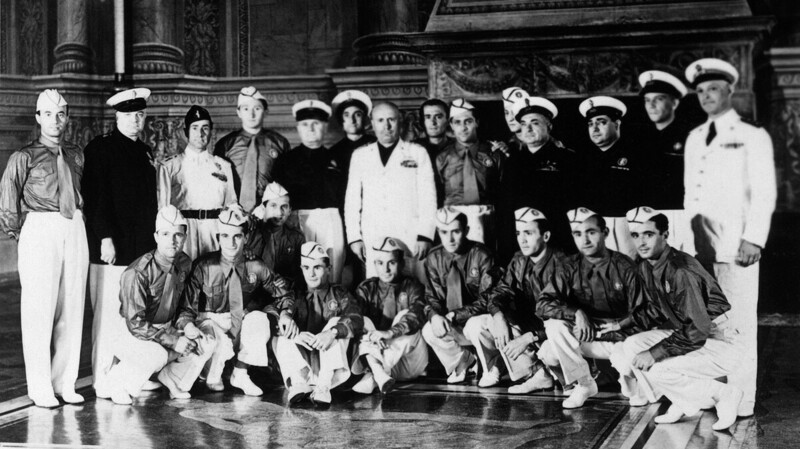 Italian dictator Benito Mussolini (center, in white) poses in 1938 with the Italian national soccer team. Mussolini sent the team a telegram inviting the players to "Win or die." Italy won that World Cup, beating Hungary 4-2. With the 20th FIFA World Cup men's soccer tournament opening this week in Brazil, it's hard to imagine a time when the world's eyes weren't fixed, every fourth summer, on which nation would be next to hoist the famous gold trophy. But from 1938 until 1950, the young event took a 12-year hiatus due to World War II, and it may have been permanently sidelined were it not for a couple of key assists — including one from this year's host nation. Soccer — or football, as it is known everywhere outside of the U.S. and Canada — was primarily a British pastime in the 19th century. It was not until the 1908 Summer Olympics in London that it was recognized as an official sport. A Frenchman named Jules Rimet helped organize the first World Cup in 1930. The Uraguayan football team, winners of the first World Cup competition, held in Uraguay, 1930. 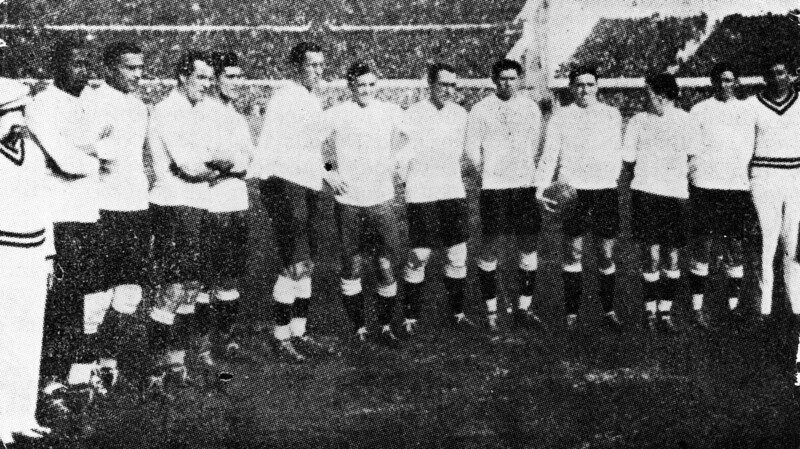 Uruguay hosted and won the inaugural tournament that year, and host Italy repeated the feat in 1934. 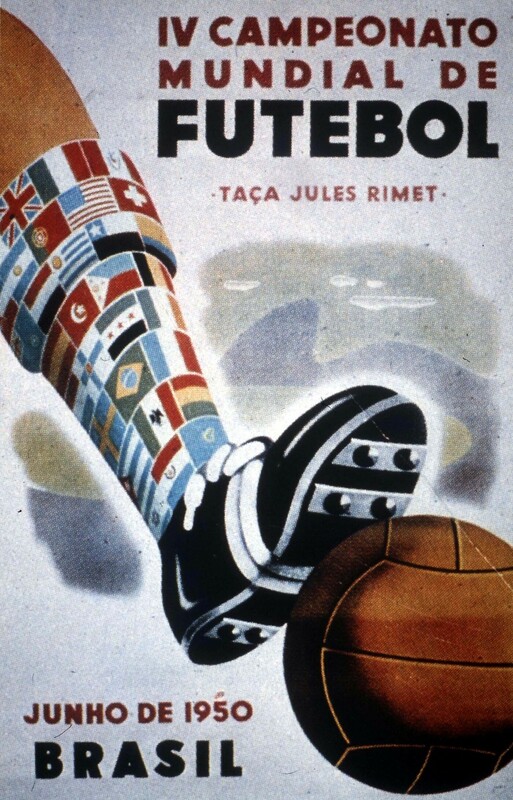 Four years later, Europe was teetering on the brink of war, but play began in the third FIFA World Cup in Paris in June 1938. Nazi officials admired how Italian dictator Benito Mussolini had used his country's 1934 triumph to promote his fascist brand, and they hoped that one of the more immediate benefits of Germany's March, 1938 annexation of Austria would be shown on the pitch in Paris. After the Anschluss, Austria's football leagues were dissolved and the best players were "invited" to join the new "Greater Germany" squad. Matthias Sindelar, Austria's top player and perhaps the world's best — known as "the Pelé of the interwar years — snubbed Hitler. He was found dead in his bed in Vienna several months later. As it turned out, the Greater German squad was defeated and, thanks to the knockout format of the tournament, eliminated by the Swiss in its very first match of the 1938 World Cup, a loss that the German coach was quick to pin on the uncooperative Austrian players. Meanwhile, on the eve of the tournament, the Italian team is said to have received a telegram from Mussolini that read simply, "Vincere o Morire." Literally translated as the ominous "Win or die," the slogan was actually a common fascist encouragement more akin to "victory or bust." Still, when the Italians prevailed 4-2 over Hungary in the finals, the apparent threat provided Hungarian netminder Antal Szabó with perhaps the best excuse in the history of goalkeeping. "I may have let in four goals," he said, "but I saved their lives." The Soccer World Cup logo, Brazil, 1950. Fourteen months later, Germany invaded Poland. Hitler had petitioned FIFA to let Nazi Germany host the 1942 World Cup, but after the war broke out, FIFA canceled the tournament, and eventually the 1946 games as well. Across much of Europe, organized football would largely cease, as the Football Association in Britain declared, "until official notice to the contrary." Following its victory in 1938, Italy retained possession of the World Cup Rimet Trophy, and Italian official and FIFA Vice President Ottorino Barassi famously had the cup transferred from a bank in Rome to his home, where he hid it in a shoebox under his bed for the duration of the war to keep the Nazis from getting their hands on it. Barassi may have preserved the trophy, but it was Brazil that saved the World Cup. With no one petitioning to host the first postwar tournament in 1950, the World Cup appeared at risk of being canceled altogether. But in July 1946, Brazil — with a growing passion for the sport, though nowhere near the powerhouse it is today — stepped forward and volunteered to host the event, and in effect saved the nascent global tradition. Without a stadium to accommodate the massive event, work began on the colossal Estádio do Maracanã in Rio de Janeiro, and FIFA called in Barassi to help the Brazilians organize the tournament. Built to hold 200,000 spectators, Maracanã was the largest stadium in the world when it opened. But the structure was not yet complete when the 1950 tournament started, and scaffolding could be seen throughout. Still, when 199,854 people watched Uruguay beat the host nation 2-1 in the final, World Cup soccer was officially back — this time to stay. Maracanã Stadium will be the site not only of this summer's World Cup final, but also of the opening and closing ceremonies when Brazil hosts the 2016 Summer Olympics. And this year, no one need worry about saving the World Cup trophy — just bringing it home.